From bitter melon to watermelon, the summer foods of Japan come from all corners of the country and range from satisfying savories to sweet-tooth-curing treats! While plenty of people lose their appetite when it gets too hot, no one struggles to eat in Japan, which has a whole store of seasonal dishes which help you beat the heat and enjoy your day. Emphasizing light dishes, fresh produce and basically creating cold versions of other dishes, you can experience meals only available for a few months of the year. While it’s easy to indulge in the the summer go-to dish of zora-soba (cold soba) followed by some of Tokyo’s best ice cream, there are plenty more options to enjoy. It’s not all about the food though—like nabe in winter, plenty of summer dishes are a social affair, be it plucking noodles from a bamboo flume or smashing a watermelon on a beach—food is only half of the deal. Read on for some of the top dishes to try in Japan this summer, including where to find them in Tokyo! Sweet, fun and refreshing, kakigori is usually the first food that springs to mind when you think of summer in Japan. Made with shaved ice and topped with myriad combinations of syrup, condensed milk and fruit, it is a delicious dessert that cools you down too. 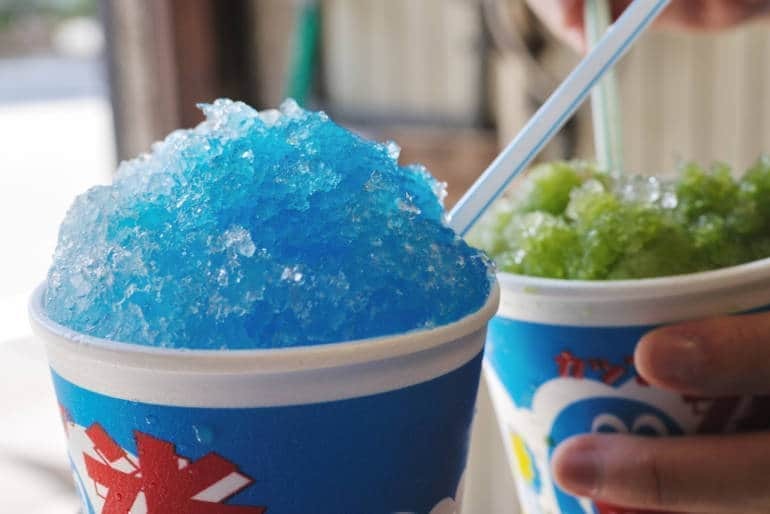 Where to try it: You’ll start seeing delicious photos of kakigori in cafes throughout summer, and the blue paper cups are easily spotted at festivals. Head to one of the Ice Monster cafes for some great modern and traditional options! While traditional shabu-shabu hotpot is a winter staple, the summer has its own version. Following its winter-warming cousin, rei-shabu involves cooking slices of pork in a hotpot, but it is then dipped into cold water and plated up atop a cold salad of raw veg. This is more like a salad if you have the patience to arrange things nicely rather than eating on the go and is usually accompanied by a sesame sauce. This is a great chance to try some of Japan’s fresh vegetables like tomato and cucumber, which are abundant in the warmer months. Where to try it: This is a great dish to cook at home as you only need a simple shabu hotpot (can be bought at home stores or even Daiso sometimes). If eating out, you’ll find it pre-prepared at izakayas and in shabu-shabu restaurants of course! A small freshwater fish, ayu is the silver-blue creature you’ll spot spiked above a grill at any festival or street-food stall in Japan during summer. When barbecued on a stick, you’ll see they are shaped to look as if swimming—this is to reflect their perseverance as they swim against the current. Their flesh has a pleasingly sweet flavor, often thought similar to melon and refreshing against the grilled flavors. While grilled with salt is the most common way to try it, you can also find it served up as tempura and in more unusual forms like ice cream! It is especially popular in August during their spawning season, but you can enjoy it throughout the whole of summer. Where to try it: Keep an eye out at any festival or busy street-food area for the shio-yaki bbq version. Alternatively look for it on specials boards at teishoku, izakaya or tempura restaurants. Simply translated to mean chilled Chinese-style, these cold ramen noodles are served mountain-like, surrounded with fresh vegetables and are a really refreshing meal that keeps you feeling light. The best noodles retain their firmness and are cooling as you eat, and the toppings are pretty flexible. Common ones include sliced cucumber, ginger, ham, and omelette, as well as seafood like shrimp—all arranged nicely around the noodles. The dish is commonly served with one of two sauces, sesame or soy, and is considered restorative if you’re struggling with the heat of summer (and who isn’t). Where to try it: Another popular dish to make at home, it’s simple to assemble for a relaxed dinner. You’ll see it in the convenience store chilled section too. 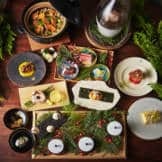 If you’re keen to try it in Tokyo, head to Yosuko Saikan in Jimbocho for a high-end version presented in Fuji-like glory. Senrigan near Higashi-Kitazawa Station serves up huge towers for low prices and often has a queue. Or you can look out for chain Ban-nai in Tokyo who offer reasonable prices for decent dishes. Served with green tea and often featuring chestnut, yokan is a jelly-like dessert made from red bean paste, sugar and agar—served in clear cubes or slices. In the summer, mizu yokan—meaning “water yokan”—is served in its place and is a softer version made with a little more water. Creating a light texture which almost manages to quench your thirst, mizu yokan has a fresh feel and sometimes comes in matcha flavor. There are plenty of wagashi to try, but this is one of the best in summer and will often be served with matcha at teahouses in shrines, gardens and temples. 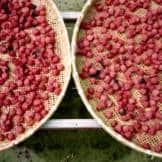 Where to try it: While you can try your luck at teahouses, if you want a guaranteed option, you can visit one of the many wagashi stores in Tokyo. Depachika have plenty of great options or you can try specialists Shiono or Toraya in Akasaka. Check our guide above for more details on where to go! Simply described as meat on a stick, yakitori is popular throughout the year, but really comes into its own during summer. More specifically, it’s generally grilled chicken, but which part specifically is often a mystery. Encompassing the sub-section of horumon which involves the offal, as well as normal bits, the only guaranteed park is the skewer. 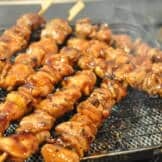 This is a festival staple, served fresh off the grill along with plenty of other meats on a stick, like pork and steak, but the little chicken skewers are a joy of their own, washed down with a cold beer at a street-side stall or yokocho restaurant. Where to try it: Keep an eye out at festivals, there’s a guaranteed yakitori supply. You can also visit special yakitori bars, try it at izakaya or visit the yokocho of Tokyo—like Omoide Yokocho in Shinjuku where you can sit outside and rub elbows with the salarymen as you feast on chicken and down the drinks. By far the most fun when it comes to summer dishes, nagashi somen involves plucking cold somen noodles as they rush down a bamboo slide in cold water. You dip your catch in tsuyu (a soy-based sauce) and try again, making playing with your food a respectable activity for an afternoon at least. The word nagashi means to flow, and often noodles left uncaught are not eaten, so you can eat plenty knowing you’re saving them from the trash. Using very thin white noodles, the dish is light and refreshing, as well as fun. If you’re not confident with your chopstick skills, you can always enjoy somen in a more standard form—chilled with dipping sauce and fresh veg. If you’re traveling to Kyoto, Kibune village should be top of your list—restaurant Hirobun serves them by a waterfall using fresh river water. Where to try it: Although this is more of a Kyoto tradition, some restaurants serve it in Tokyo. Head to Choseikan in Saitama for an outdoor experience popular with locals and families. 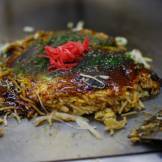 Funayado also offers nagashi somen in a traditional setting and is close to Shibasaki Station. Alternatively, you can set up your own flume or try one of the store versions for an unusual afternoon party! 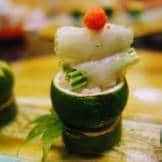 A real love-it-or-hate-it option, goya is a famously bitter melon which thrives in summer, and although it can be grown across the country, it is associated with Okinawa. The crunch is its only real saving grace (unless you love bitter, which some do) and it is used in stirfries, salads and the special Okinawan dish of goya-champuru, a mix of tofu, bean sprouts, egg, pork and goya. As it is cooked for longer to remove the bitterness, this dish is a great introduction to goya as well as Okinawan cuisine. 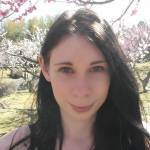 There are benefits to eating this bitter fiend though; it is considered to have anti-aging properties as well as being packed with vitamins (B1, B2, B3, C, zinc, magnesium, calcium, iron… the list goes on). It’s considered especially good for getting rid of kidney stones, lowering blood pressure and curing hangovers! Where to try it: Dachibin Izakaya in Koenji was one of the first spots to introduce Okinawa food in Tokyo and has been running for over 30 years. They have performances on some nights and a great atmosphere. Taketomijima in Ginza does a great goya-champuru and also serves over 50 kinds of awamori, the Okinawan alcohol all backed by island projections! Ok so this seems basic, but there really is nothing like Japanese watermelon on a hot day, and leaving without at least a slice would be a travesty. Despite what the internet often attempts to prove, they are not all square (although they can be if you want) and they don’t all cost a fortune. However, as they are a really popular gift in the summer months, you’ll often see them sold with a bow and they can be pricey in department stores. That might make it confusing when you see excited groups cheering as a blindfolded child attempts to smash one with a stick at the beach/festival/park. This popular summer tradition, known as suika-wari is similar to a pinata game, and is really fun, especially since you can eat chunks of watermelon after. 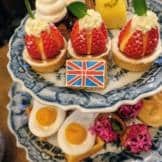 As well as eating actual watermelon, you’ll see plenty of themed-items during summer, from drinks to ice creams and extravagant cakes (Dominic Ansel Bakery is a good spot to look for seasonal ones). Where to try it: You can pick up pre-sliced watermelons at any supermarket or purchase a whole one if you fancy smashing it yourself. They are great at picnics and super refreshing. Sprinkle a little salt for a bonus flavor hit and enjoy the taste of Japanese summer. Morioka reimen hails from Iwate Prefecture and is pretty much cold ramen, but with some summery additions you might not expect. Using a beef broth and topped with carrot, cucumber, tomato, kimchi and fruits like watermelon and pear, it is certainly not like any other ramen dishes available. Considered to be much healthier than regular ramen, it lacks the oiliness of its warmer cousin and had fresher ingredients, making it lighter and more refreshing. The noodles are made from a combination of soba flour and potato starch, giving them an unusual texture. Devised from a North Koren dish, it was brought over by an immigrant who adapted his local flavors to suit the local taste better, eventually creating Morioka reimen. Where to try it: If you’re not heading to Morioka anytime soon, make your way to Ginza instead. Pon Pon Sya is the go-to name for this summer treat and it’s affordable too. The restaurant serves plenty of other Korean treats, but don’t leave without trying the reimen—they do a special lunch option in summer which has a salad, extra beef and a small dessert! Simple, healthy and as refreshing as a glass of coke (sort of), hiyayakko is a cold tofu dish which proves simplicity is best. Also known as yakko-dofu, the dish is an izakaya favorite and can be great to lighten the meal if you’re having lots of fried food. Traditionally topped with spring onions, katsuobishi (fish flakes) and grated ginger as well as a dash of soy sauce, it is pretty flexible depending on the restaurant or household preference. Other options include shiso leaf, ham, cucumber, tomato, wakame or wasabi for a more modern take. Where to try it: This is easily found on any izakaya menu so you won’t have to look for long. If you want to try some fancy Kyoto-style dishes head to Mamemaru in Marunouchi, they have kyo-yasai (traditional Kyoto-grown vegetables) to serve with it too. Alternatively, it’s super simple to make at home and you can choose the toppings you like! 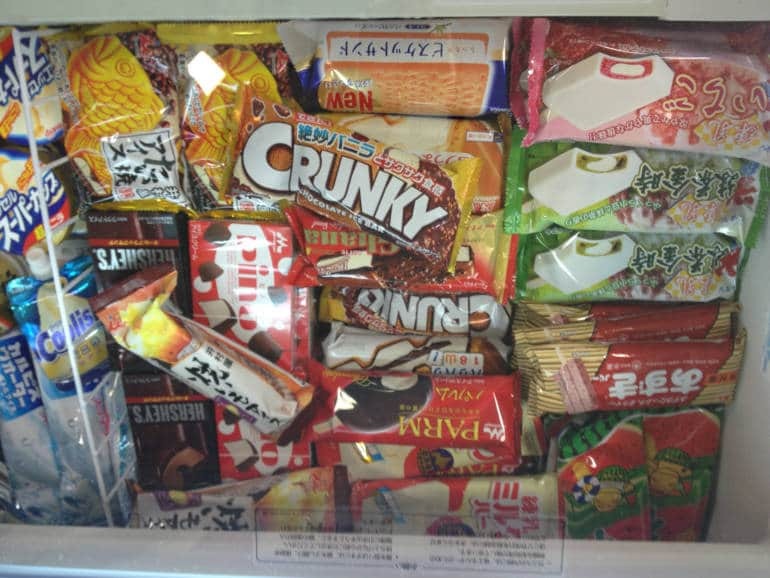 OK, so no summer list is complete without a hit of nostalgia for the good old-fashioned sugar high of a treat from the freezer section of the corner shop, and Japan is no different. Forget the Soleros and Magnums though, you can do better than that here. If you prefer ice cream, try the unusual and seasonal Haagen Daz flavors—previous years have featured tomato, but this year we have hojicha (roasted green tea), a surprisingly sour strawberry/white chocolate blend and Aroma coffee vanilla. For the lazy, a bag of Coolish squeezed straight into your mouth avoids any hard work while a Jumbo Monaka, Crunky or Black Mont Blanc is ideal if you want a substantial ice cream. For bite-size options try Pino—small ice-cream bites covered in chocolate and very, very addictive. For popsicles, there are two primary contenders, and we suggest you try them both. Gari-Gari-Kun is an easily spotted array of childhood flavors from ramune (like soda), mango, strawberry orange and grape as well as seasonal offerings like watermelon. If you’re going for the summer-fruit option though, put it back, because there’s only one frozen watermelon snack worth eating, and it’s a Suika Bar. Looking exceptionally aesthetically pleasing and tasting delicious, these are the most fun you can have on a hot day from a convenience store.